You only need 2 ingredients to make condensed milk! 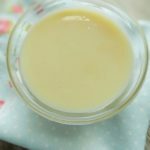 Today I want to share my homemade condensed milk recipe. Last summer I made it many times to make ice-cream. It is the main ingredient to make no churn ice cream. 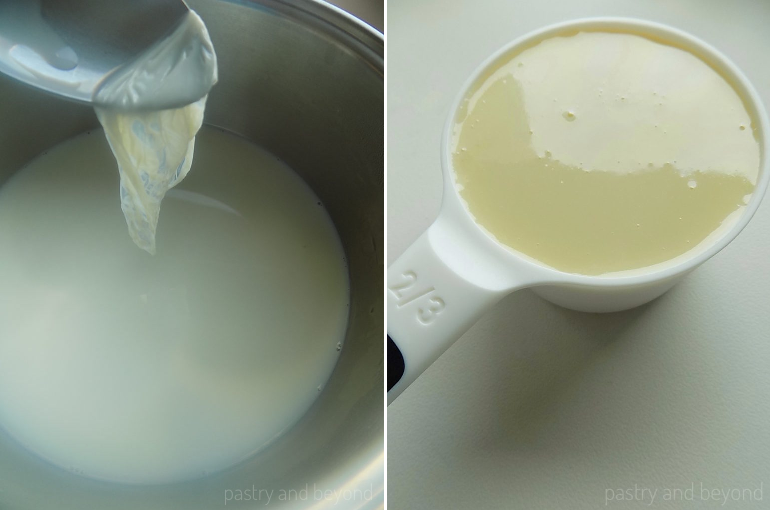 If you don’t have condensed milk, you can easily make it with only 2 ingredients. What you need is milk and sugar. 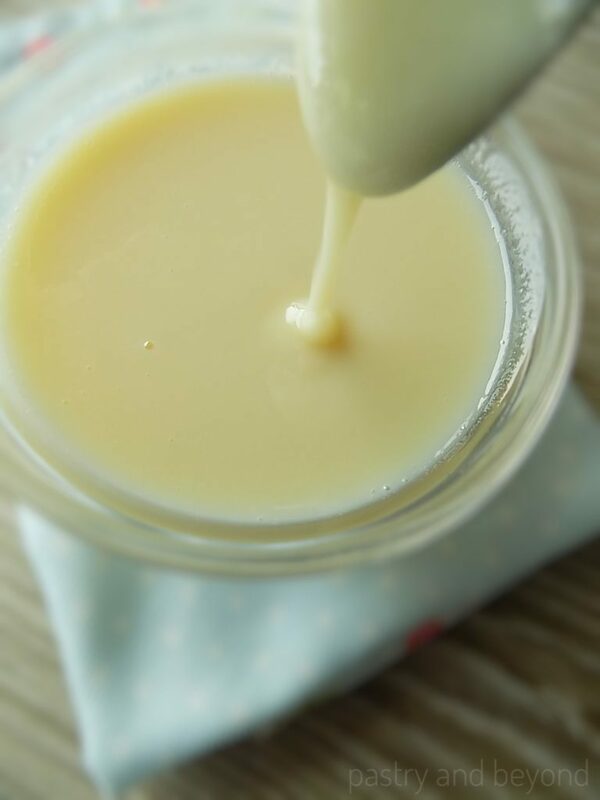 The best thing about homemade condensed milk is you have control over sugar. I use 105 grams (1/2 cup) of sugar for 490 grams (470ml-2 cups) of milk. They simmer over med-low heat. Some water is removed from milk during evaporation. When the mixture thickens and reduced by approximately 1/3, your condensed milk is ready. It makes 180 grams (-/+ 10) which is 2/3 cups. That’s all. If you double the recipe, it will be equal to almost 1 can of condensed milk. First I place milk and sugar in a pan and mix over low heat until the sugar dissolves. As the sugar dissolves, without stirring, I let the mixture simmer over med-low heat. While it simmers, a skin and foam forms on top. I take them with a spoon and I repeat this process almost 5 times as needed. The mixture becomes thicker as the milk evaporates. When the mixture thickens, the color becomes darker and the mixture is reduced by almost 1/3, I take it from the heat. This process takes almost 40 minutes. Although I use grams and don’t use cups, for today’s post, cup measurement really helps. It fills 2/3 cup. You can check the amount with your 2/3 cup. I sieve the condensed milk to make sure it is smooth, no skin is left. This summer I am planning to make different ice cream recipes with condensed milk. If you want to make ice cream with condensed milk with less sugar, you can try this recipe. Enjoy! 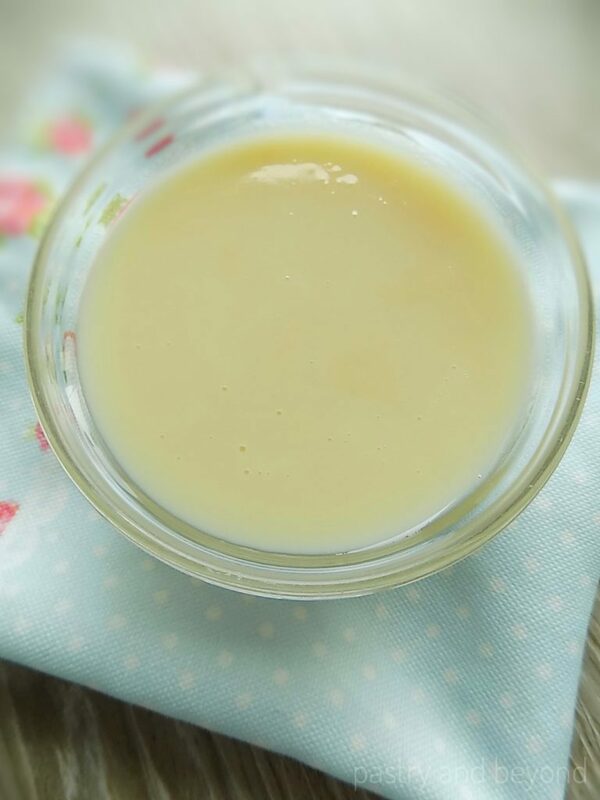 You can make homemade condensed milk with milk and sugar! 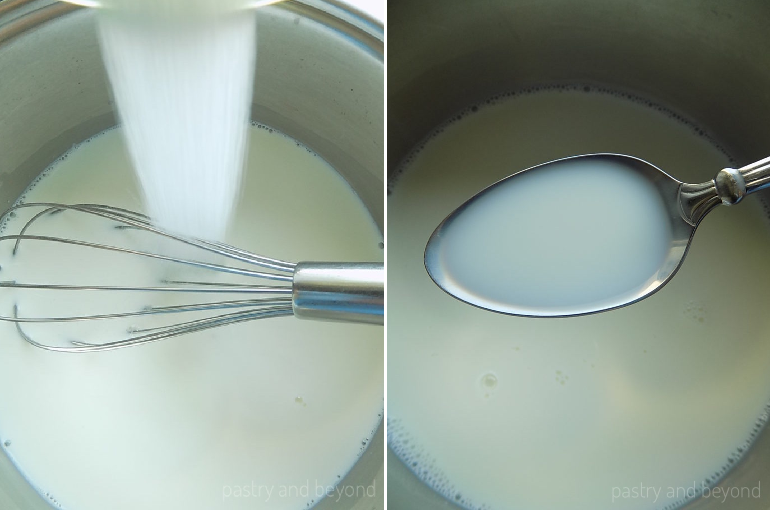 Place milk and sugar in a pan and mix over low heat until the sugar dissolves. As the sugar dissolves, without stirring, let the mixture simmer over medium-low heat. You’ll notice skin and foam on top during the simmering process. Take them with a spoon. You may need to repeat this process almost 5 times or more/less as needed. When the mixture thickens, color becomes darker and the mixture reduced by 1/3 take from the heat. It takes almost 45 minutes. Sieve the condensed milk to be sure it is smooth. After it cools, you can keep it in the fridge for a week. 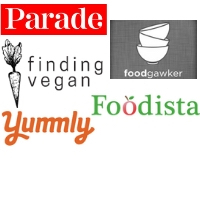 Can i use almond milk or oat milk for that recipe ? Hi! Although I haven’t tried it with dairy-free milk, I know people replace regular milk with almond and coconut milk to make condensed milk. So, I think you can use almond milk. I would love to hear your feedback if you try this recipe with dairy-free milk!